You’re about to move but you’re not sure of what to keep and what to throw away. A common problem and one not without basic solutions, but let us help you with a few suggestions all the same. Here are four specific factors to examine the problem. Love it and use it often? Not absolutely in love with it, don’t use it much? Use it but on the fence about it? Don’t use it, but love it to bits? Keep it unless it’s a huge inconvenience. By “Toss it” we don’t necessarily mean you should throw it out. You can recycle it or donate it too. Or maybe give it to a friend or relative. Plants, slightly used electronics, furniture, books…all are great candidates for this option. Consider donating it instead of trashing it. A lot of people have issues with what to keep and what to throw away, with the things that they feel define them. Part of it is because many of us live with one foot in a possible future, the one where we’re finally going to get around to fixing up that broken but familiar trunk, or the one where that giant mixer gets put to use in a marathon of cupcake making, the one where the LaCrosse equipment gets thrown on for a spring filled with pick up games at the park. Another part of it is that people in general have difficulty prioritizing — everything can seem of equal value when considered all at once. You start to feel overwhelmed and give up, leaving no time to make the best decision before your move. The point is, you don’t need to make a quick decision with any of these items. For anything with a particular emotional or sentimental attachment, the last thing you should do is rush through. If you must, create a pile for items whose fate you’re still deliberating on. Daily scans will help you make choices at a slow but steady pace, and as the pile shrinks item by item you’ll also have time to reverse a decision if in retrospect you feel it was incorrect. Don’t sit down while sifting through. You’ll start to feel as if it’s not an active task, but passive, something that can be put off. The 5-second rule — Don’t leave anything in your hands for more than 5 seconds or you’ll be too tempted to hold on to it. Grab it. Considerate. Move it to the pile or keep it. Set a hard time to begin and end, and do NOT deviate. Again, the temptation to start a little late and end a little early gets easier and easier. Not everything will be hard to make a choice about, in regards to what to keep and what to throw away. Some of it’s easy, especially if you’re a Vonage customer. 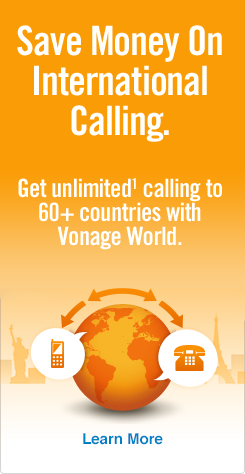 Vonage users can take their home number with them wherever they go. If you take your Vonage Box™ with you and simply plug your phone and an internet connection back into it when you’re all moved, you’ll be back up and running with Vonage’s great low rates and free calls right away. For non-Vonage customers, the same option is available. All you’ll have to do is switch to Vonage (pending 10 business day transfer period) and do likewise, take your new Vonage Box with you, etc. Plus you’ll be able to add a second line that can be local to your new home. Everyone you know can call you from wherever you are at affordable, local rates. How’s that for helping you pick what to keep and what to throw away? Click here for our full moving checklist – download, print and share! Learn more about moving with Vonage and how you can keep your number when you switch phone service to Vonage.